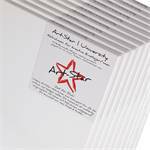 6 BK BASIC Stretched blank canvases on stretcher bars 20x100cm~8/40"
This set of 6 premium BK stretched artists’ canvases are manufactured to the highest quality standards with superior canvas quality, multiple layers of gesso priming, and improved frame durability. BK’s line of artists materials are ideal for advanced and professional artists with higher expectations. This is a set of 6 stretched canvases for artists. Each blank canvas is made of premium higher density woven cotton duck carefully primed several times with gesso, and stretched over a sturdy, bevelled wooden frame specially designed to allow for restretching of the canvas. Providing premium quality at an affordable price, these painters’ canvases are ideal for advanced and professional artists with higher requirements for their art materials. Suitable for oil and acrylic painting. New with factory packaging, each blank canvas individually poly wrapped. Premium woven cotton duck on extra strong stretcher bars with a side bolster. The special design of the stretcher bars and bolster give the canvas a little extra distance from the bar. Please note that our Professional series of BK artists canvases differ in material and quality from other canvases offered in the internet. Try it and compare yourself. We offer you a satisfaction guarantee according to our terms below. 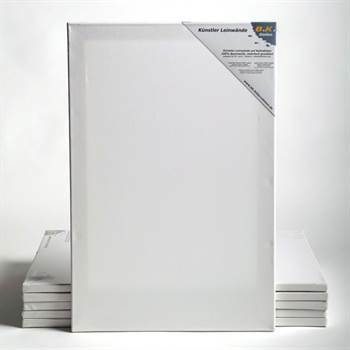 We also have even more blank stretched canvases in a wide range of sizes and quantities, so please check our listings for more.